I spent the back end of last week in Portugal, and while the trip was nothing to do with work ostensibly, I couldn’t help noticing that Lisbon appears to be the one place in Europe where Renault has succeeded in selling the new Megane in significant numbers. That observation alludes to an altogether bigger storm in a teacup that’s been blowing around Renault since the Frankfurt auto show last September. Back then, you’ll remember that Carlos Ghosn effectively bet the future of the entire company on EVs taking off in a big way – the company unveiling four electric vehicle concepts which will be put into production from next year. Renault's Twizy concept from IAA Frankfurt 2009 - a concept it has susequently advertised extensively. This rather neatly illustrates some of the issues car makers are going to face as they provide (and governments encourage) a move to an increasingly electrified automotive fleet. With the average man on the street probably still skeptical about climate change, and perception – in a country such as the UK – of the EV being rooted in the milkfloat, how does a company raise awareness of, and ‘market’, forthcoming electric cars? Are conventional methods going to work? Perhaps not. Not only that, but from the perspective of the car maker’s financial health, there’s a need to continue squeezing every last drop of revenue from current ranges (and by inference, the internal combustion engine), which is difficult, while also trying to convince people that EVs are the way forward and you’re leading the way in green initiatives. There’s no one obvious solution to overcoming such headaches; Renault is just the first to face this problem, and it certainly won’t be the last. However, I suspect we’ll see a diverse set of approaches to marketing new powertrains, which broaden the current toolbox of approaches. There is however, one approach currently employed today, which feels even more tailored made for helping the public understand the benefits, and 'believe in' EVs. For years, car makers have pushed cars into rental fleets – primarily to ease over-supply, and help boost registration (ie sales) numbers. But a known, acknowledged benefit is that as lots of people get exposure to your models, and are (hopefully) impressed by them, the model in question makes a strong enough impression that next time they’re in the market to buy a new car, that car goes on the shortlist, and potentially ends up being converted into a sale for the car maker. Clearly, Renault’s alliance partner and leader-elect in the electric vehicle world - Nissan – can see the value of such an approach, because last week they announced a deal with rental car company Hertz, who will rent the forthcoming Leaf from 2012 in Europe and the US. It looks like a smart, and obvious move for both parties. The chance to truly try before you buy – and perhaps spend a couple of days with an EV, outside of the confines and limitations of the dealership sales network, is surely a key tool in convincing both the sceptical and the curious that an EV is actually what they want to buy. Drive the change, as Renault would say. Posted by Joseph Simpson on 22nd February 2010. Dan Sturges is a transport visionary. For twenty years he’s foreseen and been tackling some of the transport-related problems the rest of the world is only just starting to grapple with. Sturges isn’t anti-car. He is simply pro shaking up mobility full stop, and believes that far from just moving people in to electric cars, we need to introduce people to a variety of vehicles - ones that are the right size for each journey they make. A couple of months back, I chatted to him over skype about his current thoughts on his company Intrago, the future of mobility, and what the auto industry is up to. You can see an edited highlight of that video below, and then after the jump I’ve pulled out and discussed what I think are the key points he made. I'm sitting here tonight trying to make sense of Ford's belief that the Fiesta Movement campaign is an example of the kind of social media that will translate into a successful Ford. Here's a picture of what it's all about. A video by Parris Harris and Yoga Army, aka Phashion Army. Fiesta Movement is getting quite the PR push at Ford right now and it'll only get worse as the December LA show draws near, when the Fiesta is actually launched in the US. What's the product? A car that Ford designed in Europe several years ago and launched there in autumn 2008. It hasn't even gone on sale yet in the US - it'll be a 2011 model year car. "Revolutions create a curious inversion of perception. In ordinary times, people who do no more than describe the world around them are seen as pragmatists, while those who imagine fabulous alternative futures are viewed as radicals. The last couple of decades haven't been ordinary, however. Inside the papers, the pragmatists were the ones simply looking out the window and noticing that the real world was increasingly resembling the unthinkable scenario. These people were treated as if they were barking mad. Meanwhile the people spinning visions of popular walled gardens and enthusiastic micropayment adoption, visions unsupported by reality, were regarded not as charlatans but saviors. When reality is labeled unthinkable, it creates a kind of sickness in an industry. Leadership becomes faith-based, while employees who have the temerity to suggest that what seems to be happening is in fact happening are herded into Innovation Departments, where they can be ignored en masse. This shunting aside of the realists in favor of the fabulists has different effects on different industries at different times. One of the effects on the newspapers is that many of their most passionate defenders are unable, even now, to plan for a world in which the industry they knew is visibly going away." The reality is that this is what's happening right now in much of the car industry. And I fear it's happening in Ford, too. Fiesta Movement is an ad campaign - nothing more. The philosophy that ever more "sophisticated" marketing can solve problems. Web-savvy, video-producing creative people will transform Ford's brand image and reconnect it with a new generation. Meanwhile Ford, despite thinking it's had a terrible year, has had a lucky one. Both of its major US competitors have gone into bankruptcy. General Motors and Chrysler are probably fatally wounded. Let's talk about real stuff - well electric cars, which aren't real yet, but will be soon. Even in a world short on EVs and high on rhetoric, Ford's current global 'electric' product range is weak - the company has one star car - the fantastic Fusion Hybrid - and a scattering of dated Escape and Mariner SUVs. The next generation? Ford has been hanging on the fence about which suppliers to use for a Focus EV – and unless there's a big surprise, we're still in limbo on that and much else as Ford insists the numbers don't add up. We're so, so far, from the car Ford really should build - an electric F150 truck. Parris and Yoga talk about Ford reconnecting with the American psyche. But Americans, beyond a few areas on East and West coasts, don't want small cars. Most of them don't even want cars. They want trucks. But the guys who design trucks are seemingly sitting elsewhere right now, watching a football game. So cars is the only place where innovation is happening. As GM and Chrysler fade away, Ford's key competition in that zone is now global. And be in no doubt that the global competition is about to become truly formidable. Renault Nissan has the boldest strategy of all - we were there to see Renault blow everyone away at Frankfurt in September, with bold plans for four production pure-electric cars by 2011, and Nissan is deadly serious about its mainstream, mass-market Leaf, due in 2011, and undoubtedly the first global car that will shake the Prius out the tree it's got right now all to itself. And that's just the start. Volkswagen is doing intriguing things with very efficient diesel vehicles, BMW's Efficient Dynamics strategy makes Ford's new EcoBoost petrol engines look pretty conservative. And that's before we talk about Honda, Toyota or anyone else. I can't help but think that Ford will default to present Renault Nissan as the crazy radicals, imagining an unrealistic future. When the reality is Renault Nissan are the pragmatists, because they and others have the pieces in place to push ahead. They've forged partnerships with entire countries to roll out electric cars, while Ford is trialing 15 electric Focuses in Hillingdon in North London, and in patches around the US. Right now Ford is not a global car company. It is a multinational car company - in fact the granddad of multinationals - with different product, management and marketing teams on different continents. And it thinks it can treat customers in different places in different ways. Imagine if Apple did that, fobbing off its American customers with a social media campaign, to launch a product it introduced in Europe over 12 months earlier. Advertising guys, dressing up social media as big change, would get nowhere. Customers would see through it right away. "Imagine if Apple did that, fobbing off its American customers with a social media campaign, to launch a product it introduced in Europe over 12 months earlier." Unless we get something better - unless we get genuinely great marketing - Ford faces slow decline. It's a long time since the ad guys alone could create a winning product. We're heading down a road where large numbers of cars will be powered by batteries in the future. Aside from the cost of batteries (dropping fast), the main reason for consumers to hesitate about jumping into an electric vehicle (EV) in the next few years, is range anxiety. We are not suddenly going to develop cars with batteries in them which will cover 500 miles on a charge, so how are we going to cover longer distance journeys? The auto industry is (sensibly) proposing a solution which meets the average driver's needs about 95% of the time. You'll be able to drop the kids at school, get to work, and then home again via the shops all on one overnight charge, which you'll do either at or outside your home. But for road trips and non-average commuters, a host of new partner firms (and industries) claim to have a solution to the range problem. Best know of these is BetterPlace - who are developing an electric car charging network in several countries, and who will provide roadside swap stations in Israel and Japan within a couple of years, where you drive in and a depleted battery will be swapped - within two minutes - for a fully charged one. Burning Rubber - What future for cars? As we hurtle towards this December's Copenhagen summit, there's almighty global momentum building around how seriously to tackle climate change. And in the end, whatever anyone might say, drastically reducing CO2 emissions implies drastically reducing energy consumption. I'll be in Bath on Friday, that great Roman and Georgian spa city and powerhouse of British engineering, to talk at a Low Carbon Southwest event on a fairly contentious topic - cars. It's been organised with Greenbang and the University of Bath. Joe and I have already been doing research for Greenbang - here's Ford's Nancy Gioia talking mass market electric vehicle with us in Detroit back in April. We'll be exploring what meeting the energy reduction challenge in the car economy really involves. The event quotes the total number of new cars on the road as having risen by 17 per cent in the last decade. The world vehicle fleet is estimated to be 622 million. In 2007, 71 million cars were produced, made up of 52.1 million cars and 18.9 million light trucks. In 2000 (remember, Millennium bug, parties, not long ago huh?) the fleet was 500 million. That's a 24% rise in just 7 years. Oh, and in 1950 the entire global vehicle fleet was just 53 million. So when does the number of vehicles in the world saturate the market? Well it's already happened in key western markets. Yet the car industry still sees the answer as being to plough on and return to sales growth. Every big auto maker (there aren't any others) needs to see growth of at least 2% per year to survive in their current form. Who'd want to be in auto sales right now? The first question is can this growth be sustained at the big picture level - can people move around with more and more vehicles on roads, while overall energy consumption from auto manufacturing, distribution and daily use gently falls, if we move to cleaner fuels and engines? The second question is what happens if sales growth isn't sustainable - if car sales are about to tip into permanent structural sales decline? I'm going to focus on the latter and explain how it wouldn't be such bad news - great alternative stuff can replace those lost sales - vehicles we can use more, not less. Services that let us swing between modes of transport in ways we just can't today visualise. All this is possible with existing technology. And it can all be designed in a way that lowers overall energy consumption dramatically. Of course, there's a third alternative. Moderately more efficient vehicles, gradual decline in auto industry, which adapts more slowly than society and its customers. Occasional death of car makers. No change. That's the one we need to try to avoid. There's more details on the event here. It's free if you're a company researching low carbon stuff, if you're a designer or engineer or you are involved in low carbon startups. The event runs from 9.30am to 12.30pm on Friday 2nd October at The Guildhall, Bath BA1 5AW. Frankfurt auto show is so huge that, even having spent three days there, it's hard to cover everything that's in the halls of the Messe. So here's a fairly personalised view of the 2009 Frankfurt auto show, edited into just four minutes. There are things in here that will doubtless seem strange to you, and there are plenty of interesting things missing - simply becasue I didn't get time to video them, but hopefully you'll enjoy and get a flavour of what it was like to be there. Note, if you click through and run this in Youtube, you can watch it in HD too. 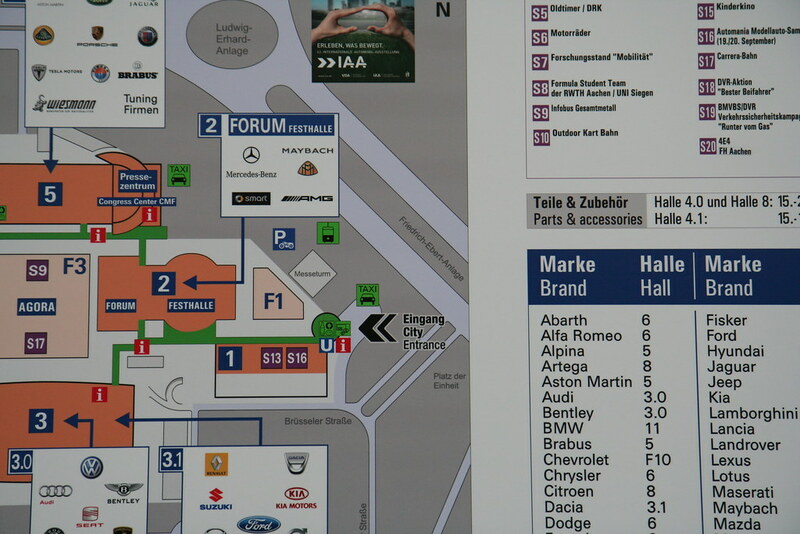 I spent just one day at the 2009 Frankfurt Auto Show and barely covered more than a couple of halls. But here's the stuff I saw that interested me. Click on the collage below or here. Press day. Frankfurt Auto Show. 15 September 2009. Posted by Mark Charmer. Mark is managing director of The Movement Design Bureau. Watch John Fleming - Ford's CEO intoduce the company's green technology plans at the IAA in Frankfurt. Like nearly every other major car maker, Ford was focusing on green - as you can see, this is what they opened the show with. The headline stories were a battery electric version of the European Focus - once again, using a powertrain built by Magna (the ones who just bought Opel and Vauxhall off GM). Then there was the unveiling of EcoBoost - in 1.6l, and 2.0l four cylinder format. EcoBoost is a new design of petrol engine that gives more grunt with less cylinders and cc. We saw and drove the V6 version in the Lincoln MKS and Ford Flex recently. Finally, there was a fitter, sharper Focus Econetic, featuring technology like stop-start, bringing the CO2 down to 99g/km. It says a lot about the pace of movement in the car industry right now that what might have been an impressive set of annoucements just six months or a year ago, seems comparatively pedestrian when held up against other manufacturers at the show. Most German firms have gone "stop-start", with smart alternators and low-rolling resistance tyres to boot, some time ago. And shortly after the end of this press conference, Renault pretty much hung their corporate future on the electric "Z.E." (zero emission) vehicle - unveiling four concepts, and saying it was committed, in a very big way, to the technology. The Re*Move team decamps to Frankfurt this week, as we’re covering the International Auto show (IAA) which starts tomorrow. So that you don’t have to blister your feet, we’ll be trudging round the messe’s vast halls – covering the important announcement and vehicle launches, asking the tricky questions and generally shoving cameras where others tend not to shove them. Primarily, we’re there as part of our ongoing work with Ford – and we’ll be looking closely to see whether there’s been any progress with Ford’s electrification strategy. We’ll also be closely examining the new C-Max, a European c-segment MPV, but one which signifies the look of the new Focus family, a car which will be launched in all of Ford’s major markets including North America. Elsewhere, we’re itching to find out what Renault’s four (yes, four) EVs look and feel like, and will be paying particularly close attention to the tiniest member of the quartet you see in this plan-view picture. Has La Regie seen the value in the personal-mobility future city market? And is it going after BMW’s project i and Toyota’s i-Series vehicles? We’ll find out. Sticking with the Renault connection, we’ll also be talking to the team from Better Place to find out how their electric car-charging network and battery swap-station plans are progressing. We’re also keen to learn more about BMW’s Vision Efficient Dynamics concept. It’s important because it’s positioning green technology, and green branding as a flagship idea which is synonymous with premium. BMW’s efficient dynamics programme has impressed us in the past, but it’s decision to make Project I vehicles a premium sell, and its recently launched ‘Joy’ brand campaign have left us flat. Where does Vision ED fit in? Aside from that, we’re keen to field questions from the watching world. If there’s anything that’s bugging you in terms of news coming from the show, anyone you want us to try and grab, or something you’re particularly interested in, get in touch – and we’ll do our best to cover it. Don’t forget all Re*Move material is creative commons licensed, so you can reuse and incorporate our words, photos and videos in your own publications. And if you want the intravenous feed of info, follow our twitter streams - @JoeSimpson and @Charmermrk (we’d also recommend @Drewpasmith, @carnorama, @ericgallina and @skymotoring if you’re watching on twitter), and we’re using the hashtag #IAATweetup along the way on twitter, and for our alternative designer/after show party on Tuesday night, which - we should point out - if you're in town, you don't need a VIP invite to get in to.... Here on Re*Move, all the material will be tagged Frankfurt. So sit back, stay tuned, and do feel free to comment or connect and ask us about what's going on. Tshuss!